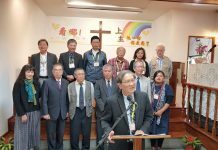 About 500-600 pastors and elders from Atayal Presbytery, as well as their “One-leads-One” team gathered at Indigenous Cultural Center in Taoyuan County to attend the assembly “One-leads-One: Sharing, Witnessing, and Giving Thanks”. Though it was pouring rain outside on that day, the sound of passionate praise songs inside the venue was more than enough to drown out the commotion outside. This is the first time that Atayal Presbytery has held a meeting for “One-leads-One” for the whole presbytery and the purpose of the meeting was to help church leaders to learn about different kinds of evangelism and thus have even more efficient outreach. The presbytery also decided during the assembly to extend the “One-leads-One” movement until the year 2020 as a means to encourage continual evangelism. There were two main programs for this assembly. The first program was a thanksgiving service and the second program was a presentation on the growth of PCT churches and an introduction to various evangelistic strategies. There were also choir and dance presentations in between these two programs, and the presentations highlighted the uniqueness of indigenous cultures. During the second program, many districts and churches reported on how they had spearheaded morning devotional times, spiritual formation seminars, holiday missions, outreach to the elderly, outreach to marginalized families, after-school tutoring programs, and ministries aimed at reinventing and strengthening existing indigenous industries. These churches also reported that indigenous towns had also held dance, singing, and basketball competitions as a means to further share the Gospel with people. Atayal Presbytery Moderator Rev. Batu Temu preached the sermon during the thanksgiving service. His theme was “Focusing our strength on One-leads-One evangelism”. He encouraged pastors and elders to be of one mind and to do their very best to reach the goals set by the Atayal Presbytery for the year 2015. Atayal Presbytery General Secretary Rev. Yumin Hayung added that Atayal presbytery has 114 churches and 13 districts. He had conducted informational meetings on “One-leads-One” in every district during the first quarter of 2012 to share the presbytery‘s vision with them. To this date, 40 churches have set up their own local “One-leads-One” committee and 31 churches have confirmed that every member of their congregation has designated at least one person they will reach out to with the Gospel. 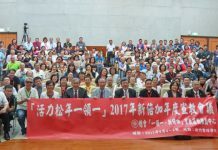 “The purpose of this thanksgiving assembly is simply to count God’s blessings as we share about what has been happening in each region through testimonies and reports,” said Yumin Hayung, adding that he felt very comforted to see such a good report from various regions within such a short time. This is proof the local pastors also see eye to eye with the General Assembly on the importance and strategy of the “One-leads-One” movement. He added that the information gathered at the assembly would be summarized into a report and sent to each church at a later date.